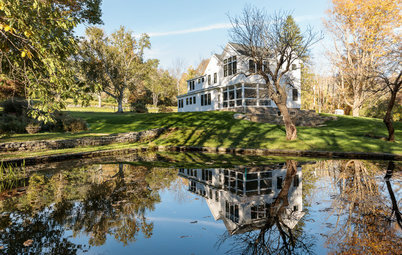 This classic center-hall Colonial outside Boston had great bones, but the dark and dated interiors didn’t suit the active young couple who bought it. 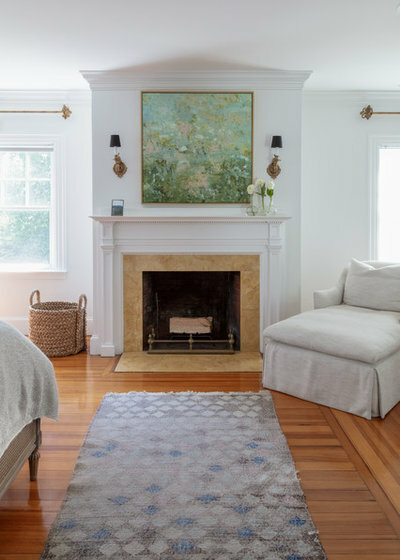 “My clients had a great vision for the home but needed help making it happen,” says interior designer Kelly McGuill, who helped them pick out paint, wallpaper, lighting and furniture. The kitchen and the master bathroom required down-to-the-studs renovations. 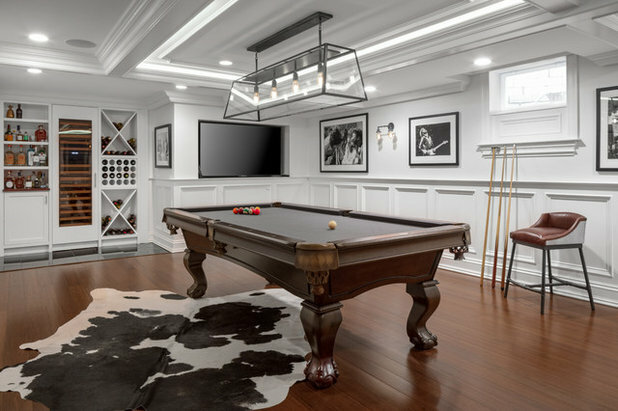 The project also included transforming the basement into a place to play billiards and watch movies, and turning the space over the garage into a his-and-her office. 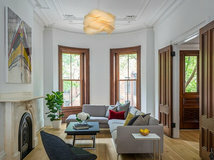 The couple wanted to honor the 100-year-old home’s classic architecture in a bright and updated way. Maintaining a “plain and simple” design philosophy ensured that the house would be timeless. 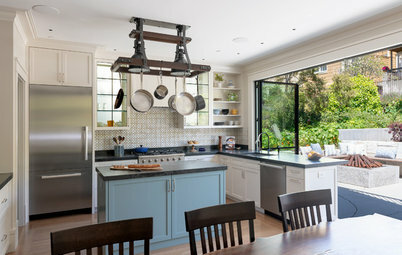 “We started with the lighter cosmetic projects to help them get their feet wet, and after that, they were ready to tackle the bigger projects, like renovating the kitchen,” McGuill says. She collaborated with Haven Builders to get everything just right. “Before, there were cherry cabinets everywhere, and there wasn’t much natural light,” McGuill says. 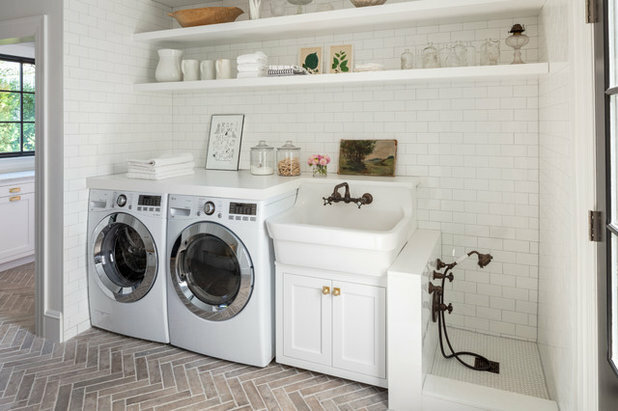 To gain space in the kitchen, she removed a wall and relocated the laundry room. 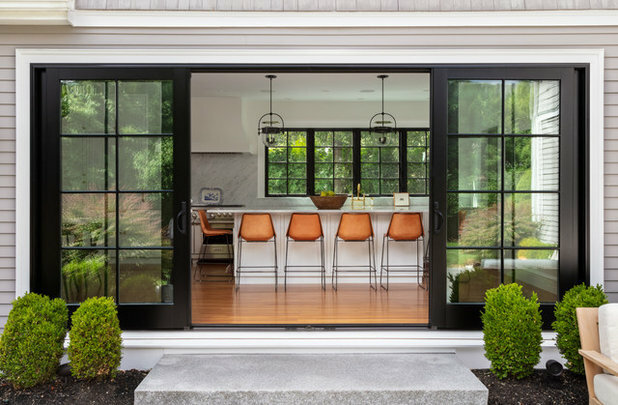 New 16-foot-long sliding doors open the room to the patio and keep it bright all day. The windows bring in strong black accents that contrast with the crisp white paint. 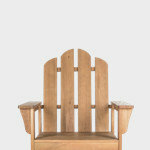 The homeowners entertain a lot and are involved in philanthropy, so they host parties and meetings. They also wanted to design for the children they hope to have. “They loved the idea of having a large island for everyone to gather around and a nook,” McGuill says. The room has a classic look with a few modern touches. 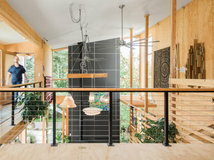 The original flooring throughout the home was longleaf pine. “Keeping these original floors was really important,” McGuill says. It was no longer available new, so she tracked down reclaimed longleaf pine flooring and had it sanded and stained to match. 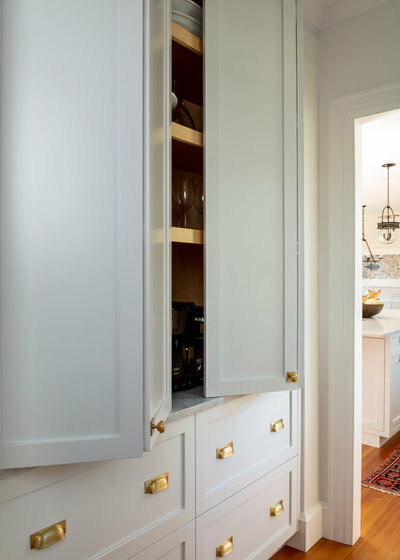 The Shaker-style cabinets are timeless. 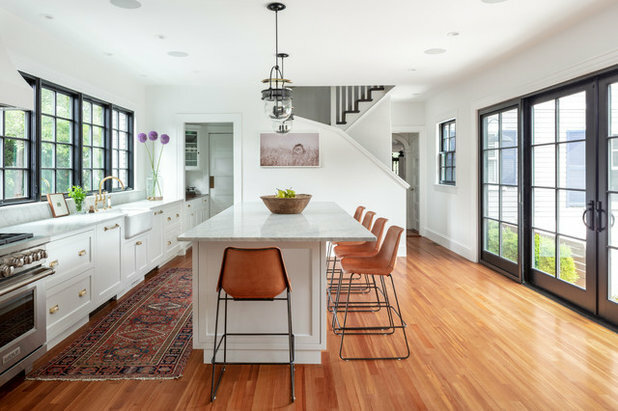 Brass hardware and Carrara marble countertops speak to the home’s original architecture, but the squared-off countertop profile lends a more current look. 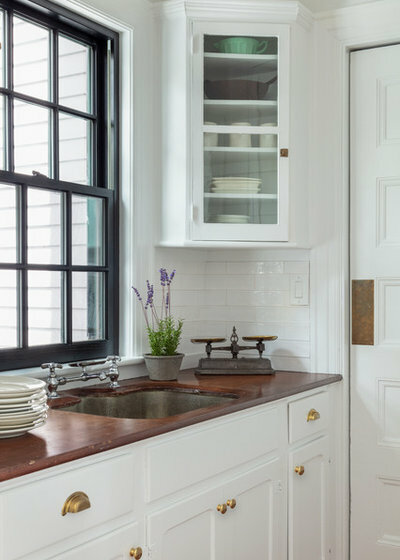 The black around the windows, the gallons of white paint and the leather counter stools are also updated touches. The light fixtures in the room have vintage style, but their black finishes tie them to the windows. “Using materials like leather and iron in here made it fresh,” the designer says. This butler’s pantry is through the door at the back of the previous photo on the left. The sink is handy for fixing drinks and arranging flowers. 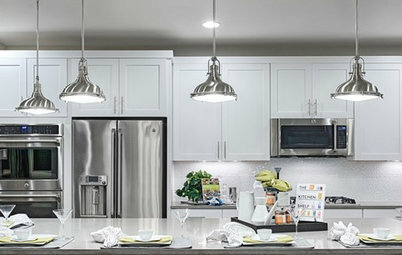 This appliance center off the kitchen houses everything that could have become countertop clutter, such as the toaster and the coffee maker. It is outfitted with electrical outlets and a Carrara marble countertop that matches the kitchen countertops. 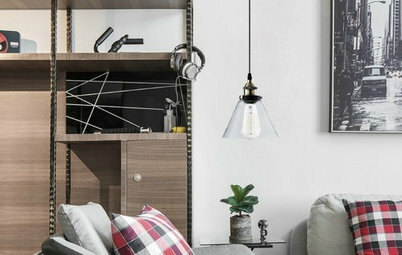 This cozy nook, with storage drawers under the banquette, serves as an eat-in area and someday may be a spot for playing games and doing homework. The chandelier has a traditional silhouette, but its dark color plays off the modern touches of black. 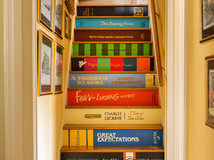 Much of the art through the home was already part of the couple’s collection. “He is a big photography fan,” McGuill says. McGuill moved the laundry room to a mudroom off a side entrance. The opening to the right of the nook leads to this folding station, complete with storage for tablecloths and three hampers underneath. “She loves treasure hunting for items at Brimfield Antiques Fair,” says McGuill, who kept this in mind when designing the laundry room. 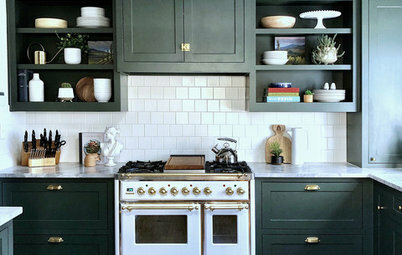 She added shelves for the antique finds and covered the walls in classic white subway tile. The farmhouse sink and the bridge faucet also have vintage style. “These kinds of touches really bring a space to life,” she says. One of the most useful features in the room is the dog-washing station for the couple’s vizsla, conveniently located next to the side entry to the house. McGuill found flooring with classic vintage style that also can take on muddy paws. It’s a porcelain tile that looks like brick, laid in a herringbone pattern. 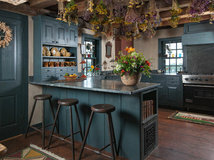 “It’s timeless, it creates a nice segue into the kitchen, and it’s very easy to maintain,” she says. The dining room has gracious proportions and architecture, which includes lovely millwork and a fireplace. “They liked the idea of a formal dining room but didn’t want to go over-the-top,” McGuill says. Again, thinking plain and simple achieved the right balance. 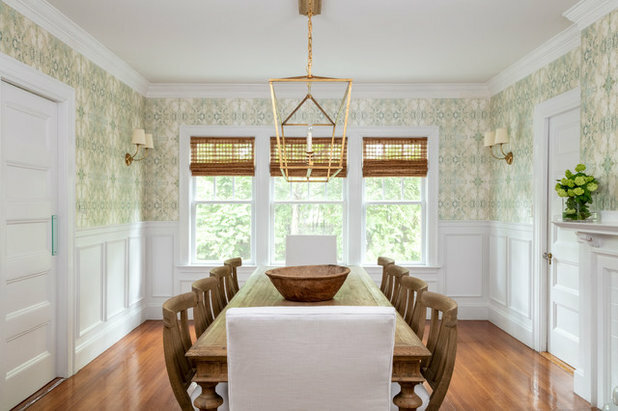 She found a beautiful soft green wallpaper and installed woven blinds for texture. 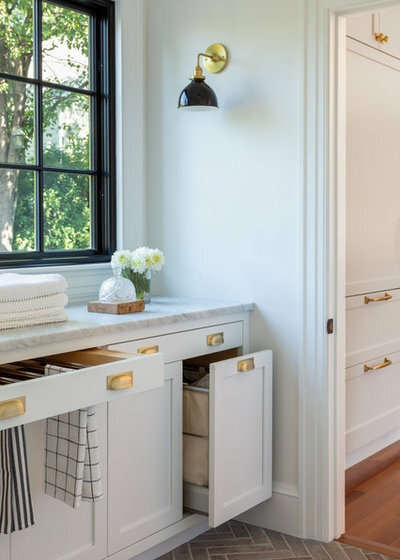 The new sconces and large lantern bring in brass touches. “That open lantern is so great because it doesn’t block the view through the room,” she says. 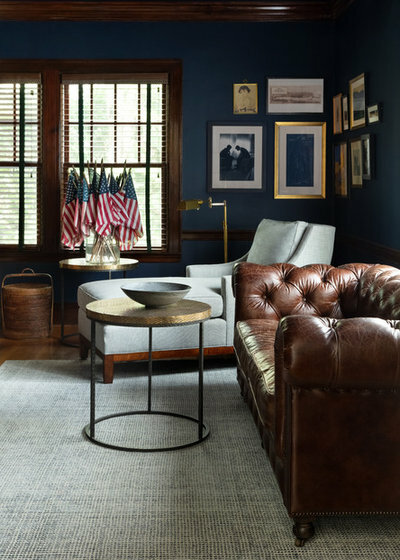 The inspiration for this den was a cigar-and-bourbon room for the gents after dinner. 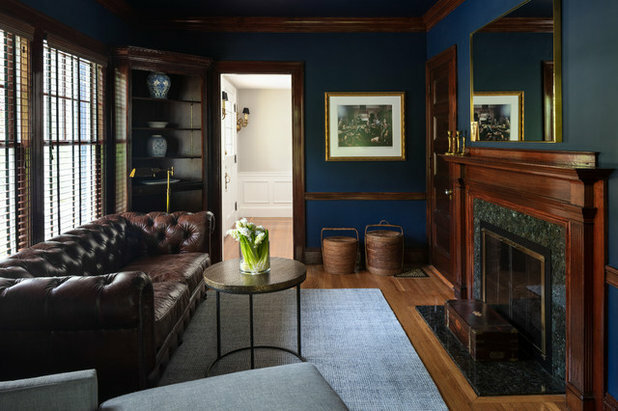 This is one of the few spots in the house where the designer chose a dark color, using navy blue not only on the walls, but also on the ceiling. McGuill opted for a leather chesterfield sofa and a comfortable chaise opposite the fireplace. 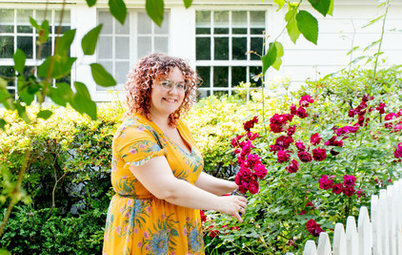 “This space is narrow, and we didn’t want to overwhelm it,” she says. The table is higher than a typical coffee table to make serving and enjoying bourbon or tea more comfortable. She arranged a gallery wall with art that was meaningful to the homeowners. The wood blinds work well with the millwork in the room. The previous living had been very dark. As with the dining room, the couple wanted to maintain a sense of formality while making it comfortable and welcoming. “It’s beautiful, but we kept it very plain and simple,” McGuill says. She painted the dark walls white and added two tailored sofas upholstered in a Perennials fabric that can take a lot of abuse. She layered two rugs underneath for coziness. 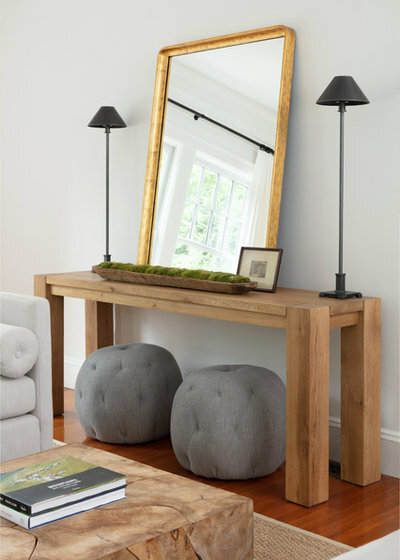 The blocky wood coffee table and the chunky console table are more casual touches that add organic texture, as do the gray poufs. The master bedroom received a cosmetic update including fresh paint, new artwork over the mantel, new lighting, white linen panels (that are off to the sides of this photo) and a vintage Oushak rug. Sconces, drapery rods and lighting continue the use of brass. Using this finish throughout the house provided continuity in keeping with its age. 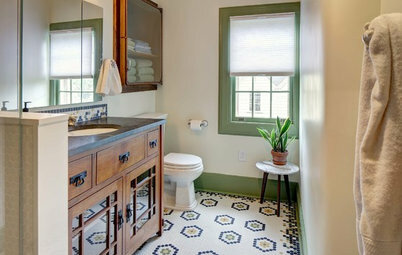 The master bathroom received a full renovation that combined two existing bathrooms. 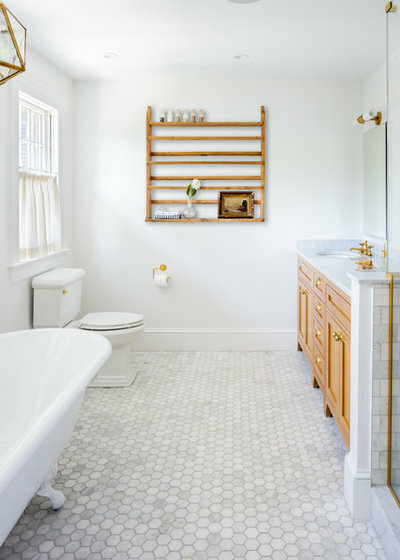 This gave the couple space for both a roomy shower stall and a claw-foot soaking tub. 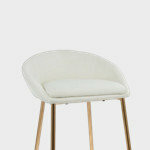 The material palette is a calming mix of white and wood. 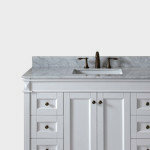 McGuill continued the use of Carrara marble introduced in the kitchen and used rift-sawn oak on the vanity. 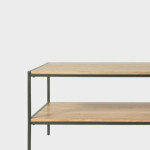 The wood plate rack is another special vintage touch. Carrara subway tile lines the shower walls. The fixtures and the hardware are brass. 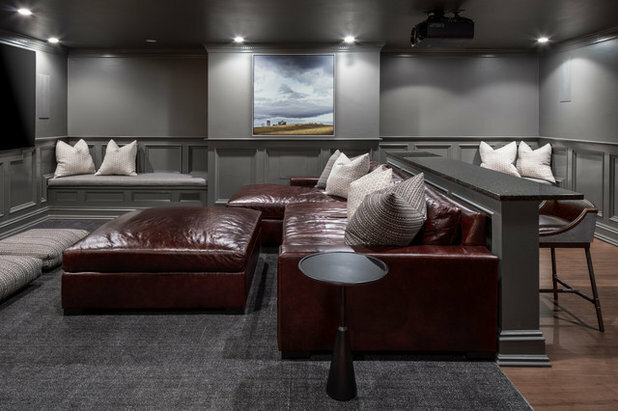 The previous basement was finished but was dark and not to the clients’ liking — for example, these walls were red. 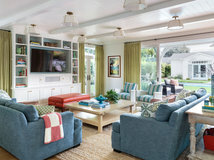 Their wish list included lightening up the space and creating a billiard room and a home theater for casual hangouts. “The basement is a real rock ’n’ roll space,” McGuill says. The photographs of musicians were from the homeowners’ art collection. McGuill lightened up the room with white paint and new lighting. 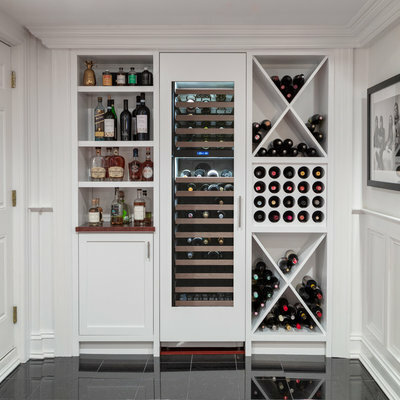 She designed this bar area to include a tall wine refrigerator. For the home theater, dark and comfy was the way to go. McGuill included a cushy leather sectional and an oversize ottoman that can handle a lot of propped-up feet. With extra seating at the bar, built-in along the walls and on the floor (with large pillows), the area also serves as a casual and comfortable hangout spot even when the owners aren’t screening something. Consider investing in large doors to open and brighten a space. To save original floors during a renovation, search reclaimed-wood and architectural-salvage dealers in your area to find a good match. 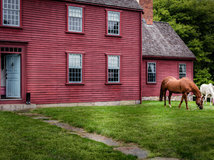 To maintain consistency between older architecture and a new design, choose materials that would have been used during the older era. 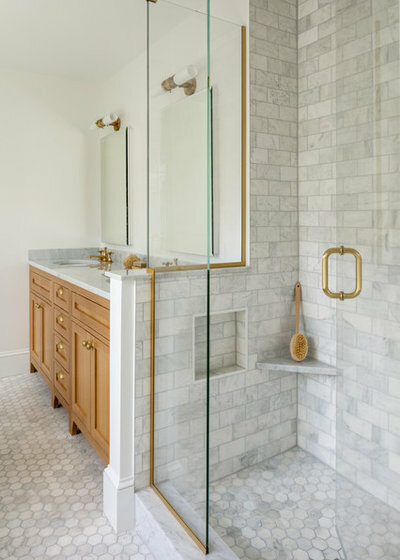 Here, the designer used brass and marble. Keep countertops clear with a designated space for small appliances. Use wood and other organic textures to give a formal room a casual touch. Thanks, @Becky Harris! I need that baby for my new (planned) kitchen island!! Wonderful transformation. 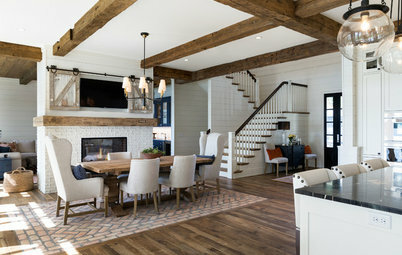 Since I'm not a designer, this may be either wrong or obvious, but, looking at the rooms — which are perfect as they are — I thought that they could easily be adapted to reflect future changes in the homeowners taste or style, without major redecorating costs or effort. I think that's brilliant. Dog washing stations are not an extravagance! Big muddy feet in and out of the house all day long are a fact of life and a lifesaver especially when lifting a dog into the sink is no longer an option. Also useful for human feet after working in the garden or playing in the sandbox.